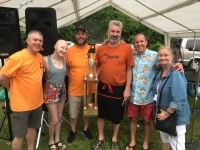 More than 200 people recently attended a barbecue rib cook-off at the Bay Lodge, sponsored by the Bay Men's Club, to raise money for Bay Village residents Dave, Andrea and Claire Blevins. Bay High junior Claire is currently battling leukemia. Eight teams competed for the title of best ribs, with Jon Lang taking the grand prize awarded by a three-judge panel. Guests enjoyed music provided by Strangers on the Street; bid on a wide variety of silent-auction items donated by local individuals and businesses; quickly sold out two different side boards, purchased Claire Blevins-designed T-shirts, and gave the Blevins family some much-needed support. 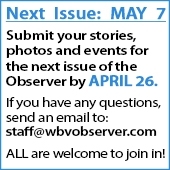 "The Blevins family is putting a lot of effort into getting Claire well again," organizer John Underation said, "so the least we could do was to put a little effort into helping them out as best we can."